The widget is a great way to provide in-product tutorials and announcements without intruding upon your user's experience. It also allows your users to replay a flow they've seen previously. The widget is fully customizable via CSS, respects user targeting conditions (just like a normal Appcues flow), and can be configured on a per-flow basis to follow page targeting (see Targeting section below for more) or to always show. Want to see the widget live? Here is a link to a totally fake demo-app that has our widget in the toolbar so you can check it out. ...If you're already convinced, let's get it installed on your application! // This is your widget instance. 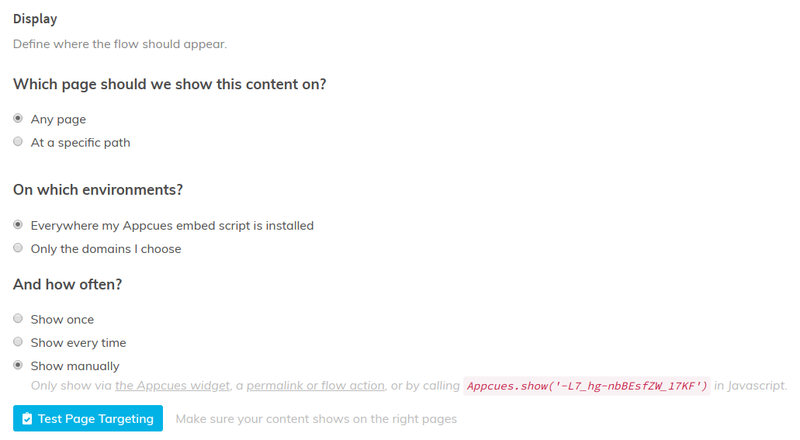 Initialize the widget to bind itself to an element on your site. // Optionally specify the position of the content relative to the widget icon. // "right" (alias "bottom-right"), "top" (alias "top-center"), "top-left", "top-right"
// Optionally add a header and/or footer. After the beta is turned on for your account, you'll notice the following options in the UI of the flow settings page. Flows published in your account will not automatically show up in the notification widget. You'll need to explicitly set them to show in the widget. Any flows that are set to show in the widget, but have already been viewed by a user, will be shown below the 'Nothing new to see here' message. The Widget icon will only display the "counter badge" if there is new content that has not been viewed. 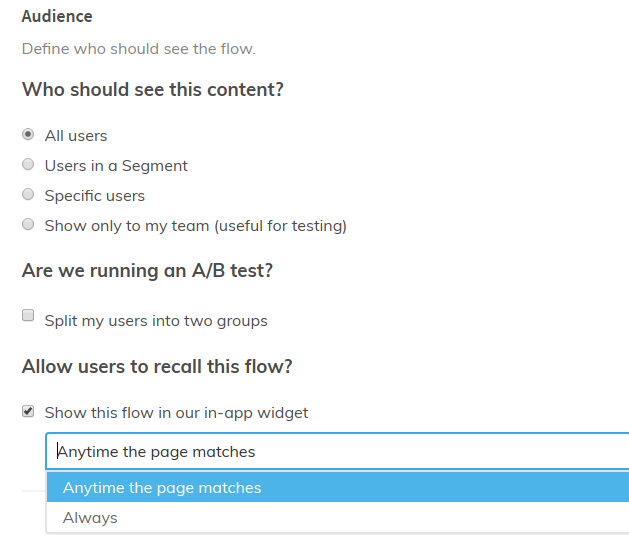 Anytime the Page matches (default): Choose this if you want the flow to only show in the widget when the page targeting (i.e the URL where you've indicated this flow should show) matches. Always: Choose this if you'd like the flow to always appear within the widget - regardless which page a guest is viewing. ProTip: You can also set the flow to only 'show manually' via the widget, and never pop up automatically for any user. To do this, select "Show manually" in your Display settings. 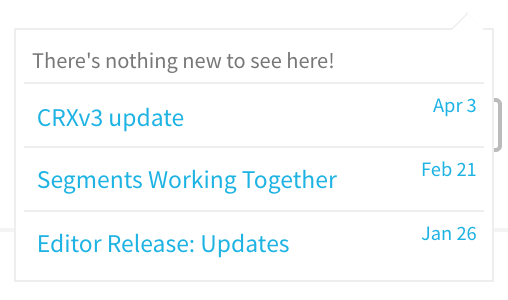 You can add custom css to your page to hide either the date and/or the "nothing new to see here" items you see below. As always, if you have questions on the above, please reach out to us at support@appcues.com, we're happy to assist!